F.F.M. 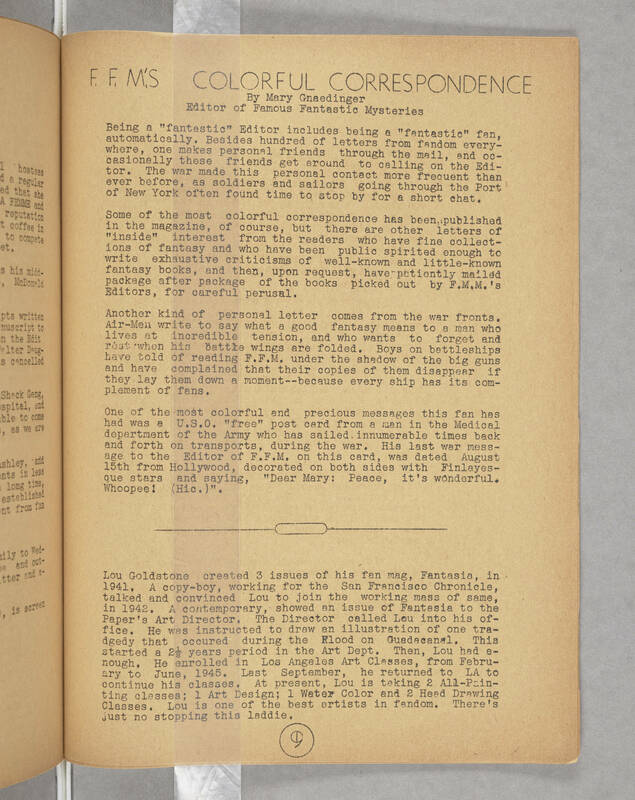 'S COLORFUL CORRESPONDENCE By Mary Gnaedinger Editor of Famous Fantastic Mysteries Being a "fantastic" Editor includes being a "fantastic" fan, automatically. Besides hundred of letters from fandom everywhere, one makes personal friends through the mail, and occasionally these friends get around to calling on the Editor. The war made this personal contact more frequent than ever before, as soldiers and sailors going through the Port of New York often found time to stop by for a short chat. Some of the most colorful correspondence has been published in the magazine, of course, but there are other letters of "inside" fan interest from the readers who have fine collections of fantasy and who have been public spirited enough to write exhaustive criticisms of well-known and little-known fantasy books, and then, upon request, have patiently mailed package after package of the books picked out by F.M.M. 's Editors, for careful perusal. Another kind of personal letter comes from the war fronts. Air-Men write to say what a good fantasy means to a man who lives at incredible tension, and who wants to forget and rest when his battle wings are folded. Boys on battleships have told of reading F.F.M. under the shadow of the big guns and have complained that their copies of them disappear if they lay them down a moment--because every ship has its complement of fans. One of the most colorful and precious messages this fan has had was a U.S.O. "free" post card from a man in the Medical department of the Army who has sailed innumerable times back and forth on transports, during the war. His last war message to the Editor of F.F.M. on this card, was dated August 15th from Hollywood, decorated on both sides with Finlayesque stars and saying, "Dear Mary: Peace, it's wonderful. Whoopee! (Hic.)". Lou Goldstone created 3 issues of his fan mag, Fantasia, in 1941. A copy-boy, working for the San Francisco Chronicle, talked and convinced Lou to join the working mass of same, in 1942. A contemporary, showed an issue of Fantasia to the Paper's Art Director. The Director called Lou into his office. He was instructed to draw an illustration of one tragedy that occured during the Flood on Guadacanal. This started a 2 1/2 years period in the Art Dept. Then, Lou had enough. He enrolled in Los Angeles Art Classes, from February to June, 1945. Last September, he returned to LA to continue his classes. At present, Lou is taking 2 All-Painting classes; 1 Art Design; 1 Water Color and 2 Head Drawing classes. Lou is one of the best artists in fandom. There's just no stopping this laddie.